Is your question not answered? Please contact us via our contact form. On CoinCheckup.com we have the Markets section on every coin detail page where you can find the exchanges that list each coin and by clicking the links you can go to exchanges and buy. How do I edit coin information on Coincheckup.com and help the community? Coincheckup.com is a research platform for all the crypto space in which we would like to involve the community. Even though we have input 4000+ hours of research and development to date, we are humans, not robots 🙂 so we might miss stuff. This is why we recently launched a User Edit Feature that lets users bring added value by adding/updating verifiable information about the coins. How can one do this? It’s simple! 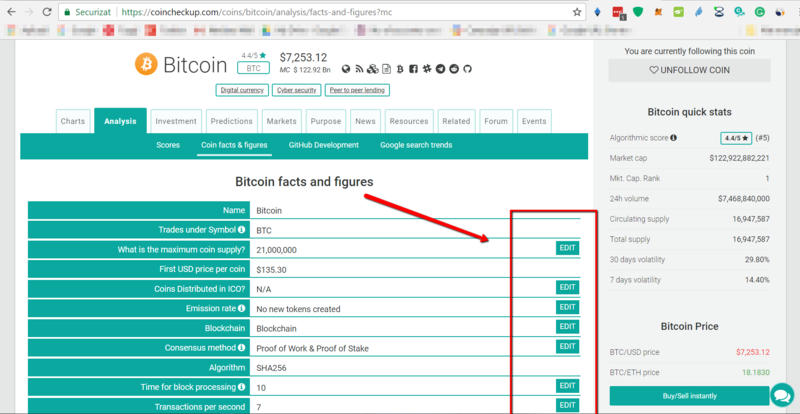 Just go to the specific coin detail page, Analysis -> “coin facts & figures” and click the edit button next to the information you want to update. And … voila! Don’t forget to add the publicly verifiable source so that your edit can be approved asap! How to analyse crypto currencies based on their fundamental data? How to use the Investment stats? How to screen your Crypto Currencies? How does the sorting functionality work? You can use the screener to make selections on multiple search criteria. Here’s a quick video that explains the screener. What will the price of a crypto do in X amount of time? Unfortunately, or maybe, fortunately, nobody knows. If we could all predict the exact way the market would go we would all be multi-millionaire and things would be boring. Do note that we have a crypto currency predictions page on CoinCheckup. These predictions are based on “what-if” scenarios. Is your question still not answered? Please contact us via our contact form.